Apart from the normal wear-and-tear shown by the chipped cabinet, the kitchen area looks dreary and has a peculiar colour palette. 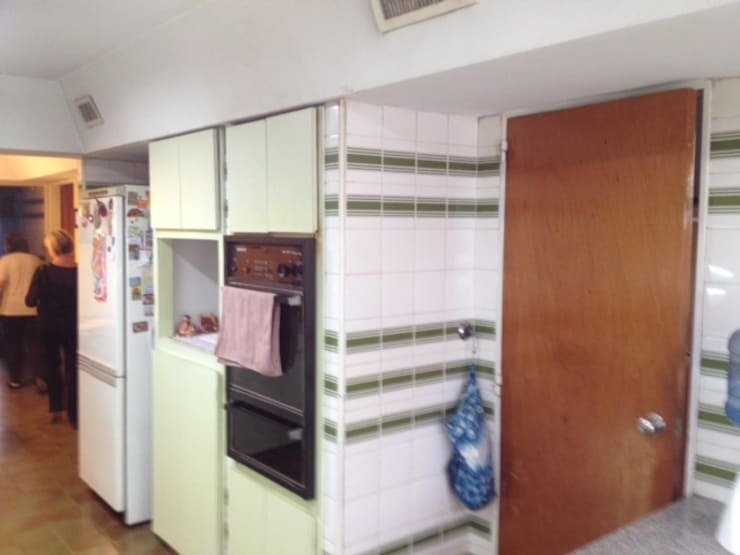 The insipid green of the cabinets lacks aesthetic appeal, and, though it matches the green striped tiles, the hue is positively sickly when paired with the old-fashioned brown flooring. The grey countertop looks completely out of place in this weird mishmash of colours. One overhaul later and the kitchen has become a modern delight! Gone is the bizarre medley of colours—the contemporary white, grey and blue scheme is beyond stylish. 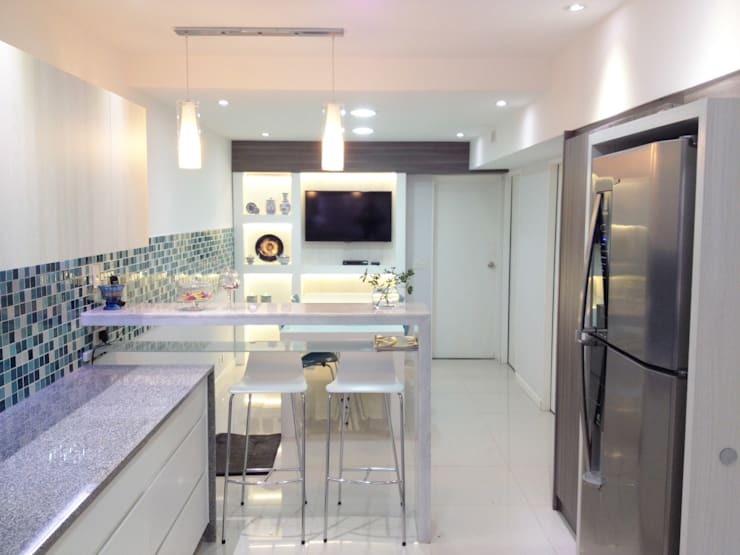 The pristine white of the floor, doors, walls and cabinets enhances the brightness of the space. The light fixtures are a snazzy touch, while the big television set and blue decorative items on the display shelf add dollops of sophistication. 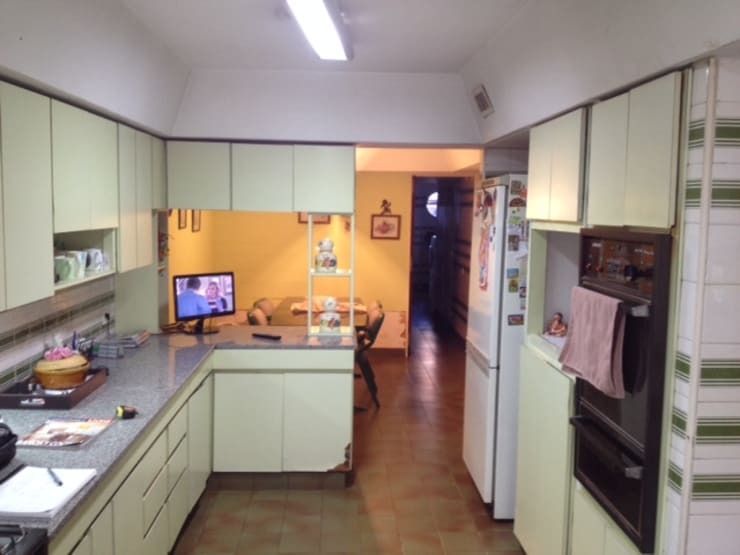 The mismatched colours are again apparent, along with outdated appliances and fixtures. A complete renovation was certainly in order! 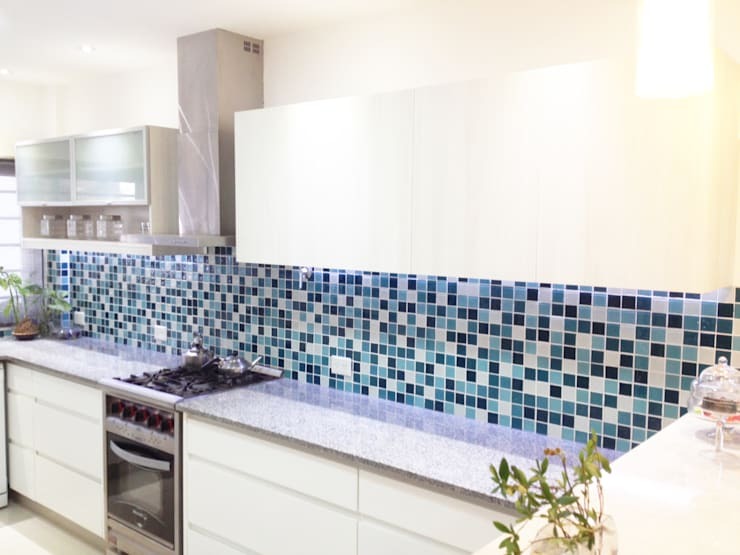 Replacing the unpleasant green which earlier graced the area is a stunning blue mosaic splashback that sits beautifully amidst the dazzling white walls and sleek cabinets. The grey countertop and slick appliances certainly look much more elegant. This is what nightmares are made of! Rather than creating a pleasant atmosphere conducive to an enjoyable meal, this dining area would kill anyone’s appetite. 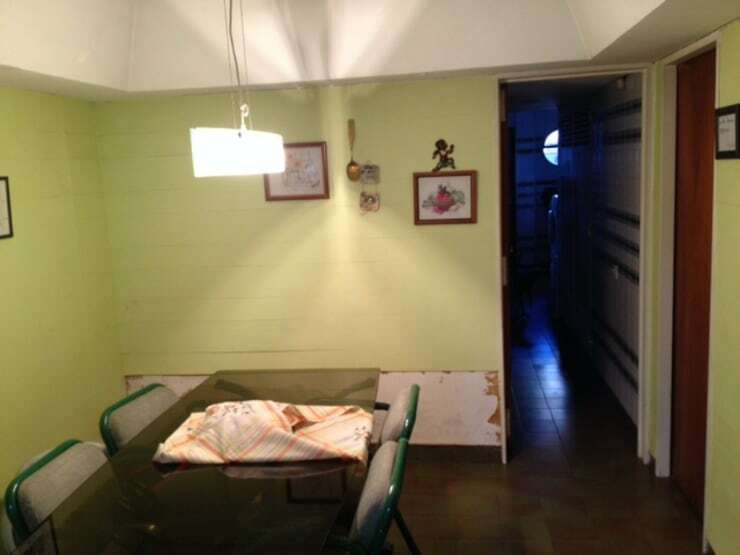 The bizarre wall colour, paired with the dated floor, chipped plaster, dark table and ugly chairs, creates a seriously dreary environment. Whether you sit at the sparkling aquamarine dining table with pretty blue chairs or at the sleek breakfast bar, this is indeed a cheery setting for a meal! Replacing the cabinets that divided the kitchen and dining areas with the breakfast bar is an ingenious touch that has integrated the two spaces perfectly. The recessed lighting and pendant lamps add a dash of contemporary pizzazz, while the large window allows a flood of natural light. 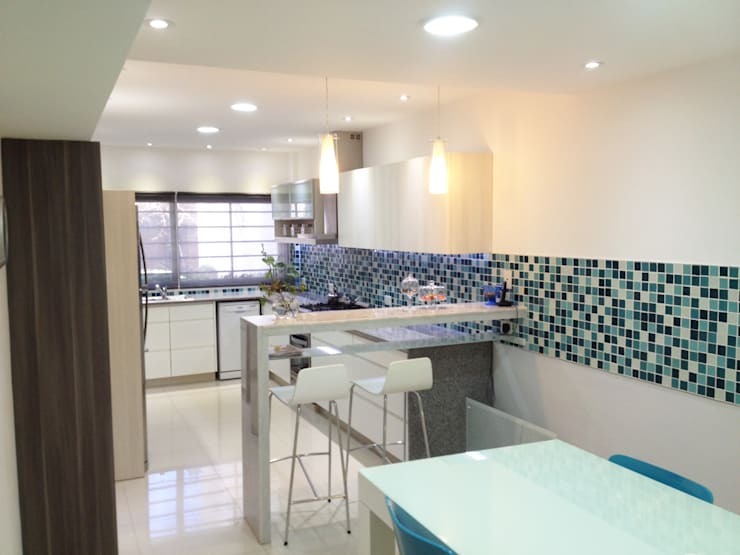 This incredible makeover, undertaken by Estudio Nicolas Pierry, combined dreamy colours and smart functionality to convert a dated, unattractive kitchen into a modern beauty! Has this kitchen makeover given you some ideas for your own?